We are very excited to host an event right in the heart of downtown Santa Cruz at the MAH in busy Abbot Square. This event will kick off our Sri Govinda Mela. We pray that everyone in Santa Cruz will come out for a wonderful evening. 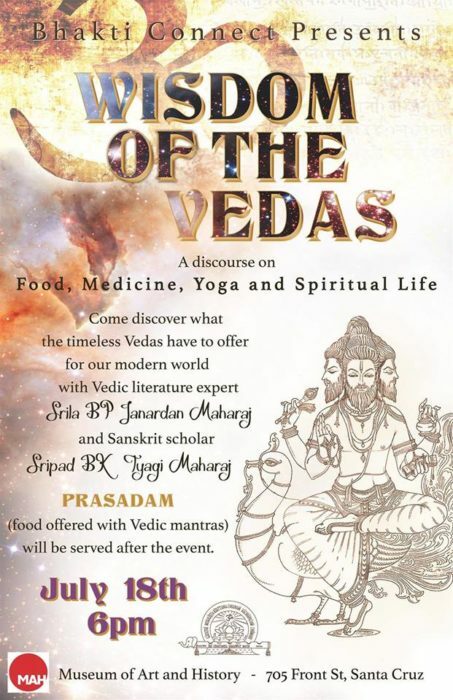 Discovering what the timeless Vedas, Vedic literature, has to offer, from food, medicine, yoga to spiritual life, for the modern world. Bhakti Connect presents this event with sponsorship from the Seva Ashram.